Who are The Whitman Tellers? In our tandem storytelling performances, we enjoy sharing lively folktales from around the world. We weave music, movement, and plenty of audience participation as we encourage listeners to jump up and join in the fun! With two decades experience as international educators and storytellers, we are passionate about the role of storytelling in the classroom. We believe that each child has a unique story to tell and that an essential part of our job as educators is to help children share their stories with the world. 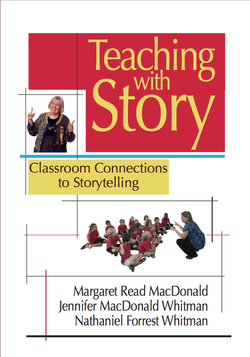 We recently teamed with Dr. Margaret Read MacDonald to write a how-to guide for storytelling in the classroom. We are excited to share Teaching With Story: Classroom Connections to Storytelling. The book pairs our thoughts about the power of story in teaching with 20 easy-to-learn folktales you can tell right away. We invite you to explore our site and consider the role of storytelling in your world! TEACHING WITH STORY- Classroom Connections to Storytelling! Teaching with Story , published by August House is the Whitman's first book. It is dedicated to rekindling the passion for communication in schools that can only be found through oral storytelling. With chapters covering communication, community, written language and storytelling's links to the Common Core. This book is indispensable for the educator, librarian or leader who wishes to take their communication to the realm of extraordinary! An Argument For "Teaching In the Round!"